Get instant access to a lot of relevant information about Chilliwack, BC real estate, including property descriptions, virtual tours, maps and photos. 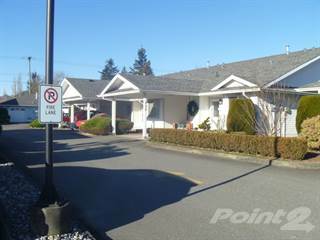 Point2 Homes gives you far more than a simple list of cheap houses for sale in Chilliwack, BC, as the search results pages also have a lot of information on Chilliwack, BC, right below the listings. Among the deep filtering functions on Point2 Homes, you can use Chilliwack, BC real estate prices, square footage, amenities and many other criteria to help narrow down your search. Price drops are another feature at your disposal, which can be especially useful when you’re looking for cheap houses or cheap condos. Use the map view to find Chilliwack, BC cheap homes for sale, based on city features or amenities that you may want close by. You can close in on a specific neighbourhood or area by simply drawing around it with the polygon or radius tools. Never miss an opportunity for a cheap home, by saving your searches. This way, you get new listings in your inbox, daily or every week, based on your preferences and your budget. If you’d like to get in touch with a professional, agents are displayed next to their listings, and they’re easy to contact through the online forms or directly by phone – all their contact information is displayed. If you want more options in terms of professional advice, you can click the Tools tab and Find an Agent, and you’ll get a list of helpful and knowledgeable real estate agents in Chilliwack, BC. Visit the Point2 Homes blog and you can find up to date expert advice on many markets throughout Canada, regular market reports, neighbourhood scoops in cities throughout the provinces, best deals for cheap homes, and other useful recommendations. Located on the west coast of Canada in British Columbia, Chilliwack sits around 102km southeast of Vancouver and is the largest city in the Fraser Valley second to Abbotsford. Chilliwack has a population of around 84,000 and is known for its beautiful setting, proximity to the mountains, recreational activities, and great quality of life. The city covers an area of 261 sq. km, and the climate is fairly mild with wet winters and warm, dry summers. Generally, temperatures don’t dip into the minuses, creating a pleasant, temperate climate. The key industries in Chilliwack are agriculture, retail, lumber, finance, tourism, and food processing, and the retail and services sectors account for around 50% of the city’s GDP. Chilliwack is home to over 900 farms, specifically dairy, vegetable, poultry, fruit growing, and many others, and the city rests on some of the most fertile lands in the whole of the country. Recreational activities can be enjoyed year-round, with the most popular being hiking at places like Mount Cheam and Slesse Mountain, fishing, camping, golfing, and horseback riding. The city also has some great urban amenities such as shops and restaurants, as well as an emerging art scene. Chilliwack is a wonderful place to live and offers a great quality of life and more affordable real estate compared to other areas of British Columbia. It’s a haven for outdoor enthusiasts as well as those looking for a quiet yet urban lifestyle. 8% of the city’s population is made up of people of Aboriginal descent, 5% is made up of people from visible minorities, and the remainder is of European origin. Chilliwack’s position in BC’s real estate market is incredibly strong at the moment and it’s a great city for both investments and setting up a life. The area is growing in terms of its economy, its population, businesses, and real estate, and its beautiful setting and quality of life are undeniable. It’s a commutable distance from Vancouver and has great access to the surrounding cities via the Port Mann Bridge and Golden Ears Bridge, and many people are opting to sell or move away from areas like Vancouver and Burnaby and relocate to a more affordable lifestyle in Chilliwack. The market has balanced out since its 2016 boom and prices are steady and stable. The average house price in Chilliwack is around $439,000, and you can find a four-bedroom bungalow for under $500,000. There is a range of housing available, from condo units to large ranch properties. Buyers consist primarily of locals, either buying their first home or moving further out of the centre of Vancouver, and nowadays there are fewer foreign buyers due to the recent Foreign Buyers Tax implementation. Housing inventory levels are currently fairly low in comparison to previous years, but there are still a lot of options and neighbourhoods to choose from. BC as a whole has a strong and growing economy and the property market is a sound investment. All in all, Chilliwack is a truly great place to live. There are also a number of reasonably-priced real estate options in Chilliwack, and the city is known to have some of the most affordable real estate in the Lower Mainland Area. However, it’s thought that prices will be affected more in the coming years since many people are moving out towards Chilliwack from the Lower Mainland in search of more affordable housing. An apartment or condo can be found for less than $200,000 in areas like Chilliwack proper and Sardis, and the city offers great value for money and a pleasant lifestyle so it’s a great option for first-time buyers and young families. Young people are also being helped out by the BC Home Plan, which allows 5-year interest-free mortgages, and is designed to help first-time buyers get on the property market.